The Cape Breton Screaming Eagles believed they tried to allay Nicolas Roy's family's concerns about his schooling, but there's only so much they can do about geography and their recent history. Cape Breton, over the weekend, confirmed the inevitable by saying it will consider the QMJHL's No. 1 overall pick a no-show. The compensation starts with the No. 5 overall pick in 2014, plus whatever Eagles coach-GM Marc-André Dumont can get from the inevitable bidding war due to break out among many of the Q's 12 teams based in La Belle Province. The Roys' emphasis on education is probably equal parts sincere and cover. Reaction's been divided. François Parenteau of La Presse expressed frustration with advisers and parents who want their son to reap all the rewards of playing major junior, but don't want to take the risk of not landing with a magnet franchise. Radio-Canada's Martin Leclerc was more temperate, pointing out that even a 16-year-old as ballyhooed as Roy is not guaranteed of NHL riches. “We feel we have exhausted all options in convincing him,” Marc-Andre Dumont, Cape Breton’s head coach and general manager, said in a release. The Screaming Eagles announced in the release they intend to take steps to receive compensation as outlined in the league rules. Being perceived as an undesirable team for players who have the talent to call their shots certainly can hurt a team's image. In my mind, taking a player who's signable can be even worse since it's conceding defeat without even trying. Cape Breton, after finishing in the cellar a year ago, probably needs more than one player to achieve respectability. Getting a package might be better for its depth. So there's that. 2009 Niagara IceDogs (OHL), Lucas Lessio — The current Phoenix Coyotes prospect, as the No. 7 overall pick in the OHL, opted not to play for the 'Dogs, stating he would play for the University of Michigan. Niagara waited until the next-to-last possible day of training camp to deal Lessio's rights to the Oshawa Generals. Lessio decided to join the Generals for his NHL draft season; Oshawa was eliminated from the playoffs by Niagara both that season and in 2012. The defenceman taken with the comp pick, Luke Mercer, is entering his fourth season in Niagara and has been a stable contributor. Granted, one can only imagine that the 2011-12 IceDogs, who had six players who would go on to play for Team Canada, would have been even more lethal with Lessio. But the eventual league runners-up were all well spoken for on the offensive end. 2010 Barrie Colts (OHL), Kerby Rychel — The infamous Rychelgate. In the midst of a Colts-Windsor Spitfires league final, Barrie nabbed Rychel at the end of the first round. There was no way to not take that as a shot across the brow of Windsor GM and part-owner Kerby Rychel, who had planned on taking his son in Round 2. The Colts traded Kerby Rychel to the Mississauga-St. Michael's Majors, where he played half of his rookie season before being reunited with his father in southwest Ontario. There's not necessarily a correlation, but the Colts reached the OHL final last spring while the Spitfires missed the playoffs (not through any fault of Kerby Rychel, who's now a Columbus Blue Jackets first-rounder). The middlemen in Missy were also Memorial Cup runners-up in 2011 with contributions from a handful of former Spitfires. 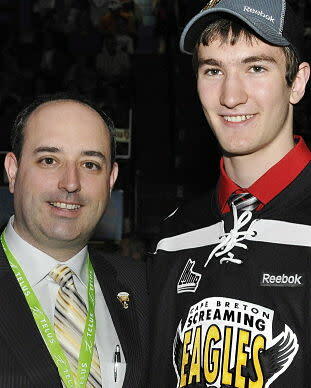 2011 Baie-Comeau Drakkar (QMJHL), Nathan MacKinnon — Drakkar GM Steve Ahern parlayed the future Colorado Avalanche's pick's junior rights into a package of picks and players from the Halifax Mooseheads. That helped Baie-Comeau go from second-last in 2010-11 to league runners-up in 2012-13. Granted, it was runner-up to the Mooseheads, but there were 16 other teams which would have loved to have been in the President's Cup final. Plus this happened, so everyone won. 2011 Kingston Frontenacs (OHL), Max Domi — The speculation prior to the the priority selection was that Domi was ticketed for the London Knights. London, though, took Bo Horvat, who was likely higher on the organization's draft board, with its No. 8 pick. Then-rookie Fronts GM Doug Gilmour's reflex action was to choose Domi rather than take a lesser but signable player. Gilmour parlayed Domi's no-show into a comp pick he used to take Sam Bennett, who almost immediately became a top-6 forward. The two second-rounders were used on Spencer Watson, who was Canada's leading point-getting at the recent Memorial of Ivan Hlinka tourney, and defenceman Dylan DiPerna. Domi has helped the Knights win consecutive league championships, but Kingston's fortunes are expected to take an upturn over this season and next. It can be acrimonious and stir up a lot of bitterness, but name a business where that does not happen.